Boris Fyodorovich Godunov (Russian: Бори́с Фёдорович Годуно́в) (c. 1551 – 23 April [O.S. 13 April] 1605) was de facto regent of Russia from 1584 to 1598 and then the first non-Rurikid tsar from 1598 to 1605. The end of his reign saw Russia descending into the Time of Troubles, a period of Russian history comprising the years of interregnum between the death of the last Russian Tsar Feodor Ivanovich of the Rurik Dynasty in 1598 and the establishment of the Romanov Dynasty in 1613. Godunov's life was the subject of two of the great works of Russian art, a drama by the famous Romantic poet and writer, Alexander Pushkin and the opera by Romantic composer Modest Mussorgsky. The sense of intrigue that surrounds the events of Godunov's life proved great dramatic material for their artistic imaginations as the end of the founding dynasty, which precipitated a period of confusion that even led to the rise of a false heir to the throne, was not only of great historical importance but full of dramatic intrigue as well. Boris Godunov was the most famous member of an ancient, now extinct, Russian family of Tatar origin, which migrated from the Horde to Kostroma in the early fourteenth century, through the Tatarian Prince Chet, who emigrated from the Golden Horde to Russia and founded the Ipatiev Monastery in Kostroma. Boris was the son of Fyodor Ivanovich Godunov "Krivoy" (d. c. 1568-1570) and wife Stepanida N. His older brother Vasily died young and without issue of his wife Pelageya N. Godunov's career of service began at the court of Ivan the Terrible. He is mentioned in 1570 as taking part in the Serpeisk campaign as one of the archers of the guard. The following year, he became a member of the feared Oprichnina. In 1570/1571 Godunov strengthened his position at court by his marriage to Maria Grigorievna Skuratova-Belskaya, the daughter of Ivan's abominable favorite Malyuta Skuratov-Belskiy. In 1580 the Tsar chose Irina (Alexandra) Feodorovna Godunova (1557 – October 26/November 23, 1603), the sister of Godunov, to be the wife of his son and heir, the fourteen year old Tsarevich Feodor Ivanovich (1557–1598); on this occasion Godunov was promoted to the rank of Boyar. On November 15, 1581, Godunov was present on the scene of Ivan's murder of his own son, also called Ivan. Though he tried to intervene, he received blows from the Tsars scepter. Ivan immediately repented, and Godunov rushed to get help for the dying Tsarevich, who died four days later. Upon his death Ivan also left behind the three-year-old Dmitri Ivanovich (1581–1591), born from his seventh and last marriage. As the Orthodox Church recognized only the initial three marriages, and any offspring thereof, as legitimate, Dmitri (and his mother's family) technically had no real claim to the throne. Still, taking no chances, the Council, shortly after Ivan's death, had both Dmitri and his mother Maria Nagaya moved to Uglich some 120 miles north of Moscow. It was there that Dmitri died a few years later at the age of ten (1591). An official commission, headed by Vasili Shuiski, was sent to determine the cause of death; the official verdict was that the boy had cut his throat during an epileptic seizure. Ivan's widow claimed that her son had been murdered by Godunov's agents. Godunov's guilt was never established and shortly thereafter Dmitri's mother was forced to take the veil. As for Dmitri Ivanovich he was laid to rest and promptly, though temporarily, forgotten. On the occasion of the Tsar's coronation (May 31, 1584), Boris was given honors and riches as part of a five-man regency council, yet he held the second place during the lifetime of the Tsar's uncle Nikita Romanovich, on whose death, in August, he was left without any serious rival. A conspiracy against him of all the other great boyars and the metropolitan Dionysius, which sought to break Boris's power by divorcing the Tsar from Godunov's childless sister, only ended in the banishment or tonsuring of the malcontents. Henceforth Godunov was omnipotent. The direction of affairs passed entirely into his hands, and he corresponded with foreign princes as their equal. His policy was generally pacific. In 1595 he recovered from Sweden the towns lost during the former reign. Five years previously he had defeated a Tatar raid upon Moscow, for which service he received the title of Konyushy (or in 1584), an obsolete dignity even higher than that of Boyar. Towards the Ottoman Empire in Turkey he maintained an independent attitude, supporting an anti-Turkish faction in the Crimea, furnishing the emperor with subsidies in his war against the sultan. Godunov encouraged English merchants to trade with Russia by exempting them from tolls. He civilized the north-eastern and south-eastern borders of Russia by building numerous towns and fortresses to keep the Tatar and Finnic tribes in order. These towns included Samara, Saratov, Voronezh, Tsaritsyn, and a whole series of lesser towns. He also re-colonized Siberia, which had been slipping from the grasp of Russia, and formed scores of new settlements, including Tobolsk and other large centers. It was during his government that the Russian Orthodox Church received its patriarchate, which placed it on an equal footing with the ancient Eastern churches and emancipated it from the influence of the Patriarch of Constantinople. This reform was meant to please the ruling monarch, as Feodor took extraordinary interest in church affairs. Boris's most important domestic reform was the 1587 decree forbidding the peasantry to transfer themselves from one landowner to another, thus binding them to the soil. The object of this ordinance was to secure revenue, but it led to the institution of serfdom in its most grinding form. On the death of the childless tsar Feodor (January 7, 1598), self-preservation quite as much as ambition forced Boris to seize the throne. Had he not done so, lifelong seclusion in a monastery would have been his lightest fate. His election was proposed by the Patriarch Job of Moscow, who acted on the conviction that Boris was the one man capable of coping with the extraordinary difficulties of the unparalleled situation. Boris, however, would only accept the throne from a Zemsky Sobor, or national assembly, which met on February 17, and unanimously elected him on February 21. On September 1 he was solemnly crowned tsar. Godunov's short reign (1598–1605) was not as successful as his administration under the weak Feodor. Extremely poor harvests were encountered in 1601–1603, with nighttime temperatures in all summer months often below freezing, wrecking crops; see Russian famine of 1601 - 1603. Widespread hunger led to mass starvations; the government distributed money and foodstuffs for poor people in Moscow, but that only led to refugees flocking to the capital and increasing the economic disorganization. The oligarchical faction, headed by the Romanovs, considered it a disgrace to obey a mere boyar; conspiracies were frequent; the rural districts were desolated by famine and plague; great bands of armed brigands roamed the country committing all manner of atrocities; the Don Cossacks on the frontier were restless; and the government showed itself incapable of maintaining order. Under the influence of the great nobles who had unsuccessfully opposed the election of Godunov, the general discontent took the form of hostility to him as a usurper, and rumors were heard that the late tsar's younger brother Dmitri, supposed to be dead, was still alive and in hiding. In 1603 a man calling himself Dmitri—the first of the so-called False Dmitris—and professing to be the rightful heir to the throne, appeared in the Polish-Lithuanian Commonwealth. In fact the younger son of Ivan the Terrible had been stabbed to death before his brother's death, allegedly on Godunov's order; and the mysterious individual who was impersonating him was an impostor but was regarded as the rightful heir by a large section of the population and gathered support both in Russia and abroad, particularly in the Commonwealth and the Papal States. Factions in the Commonwealth saw him as a tool to extend their influence over Russia, or at least gain wealth in return for their support; the Papacy saw it as an opportunity to increase the hold of Roman Catholicism over the Orthodox Russia. A few months later he crossed the frontier with a small force of 4000 Poles, Lithuanians, Russian exiles, German mercenaries and Cossacks from the Dnieper and the Don, in what marked the beginning of the Commonwealth intervention in Russia, or the Dymitriad wars. Although the Commonwealth had not officially declared war on Russia (as its king, Sigismund III Vasa, was opposed to the intervention), some powerful magnates decided to support False Dmitri with their own forces and money, expecting rich rewards afterwards. In 1605 in the midst of these intrigues, Godunov died. Immediately after Boris's death in 1605 Dmitri made his triumphal entry into Moscow, but after a short reign, he was murdered and a period of political and social uncertainty ensued until the establishment of the Romanov Dynasty eight years later. 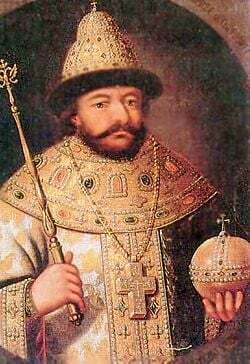 Boris died after a lengthy illness and a stroke on April 13/23, 1605, leaving one son, Feodor II, who succeeded him for a few months and then was murdered by the enemies of the Godunovs as was his widow, both murdered in Moscow on June 10/July 20, 1605. Their first son Ivan was born in 1587 and died in 1588, and their daughter Xenia, born in 1582/1591, was engaged to Johann of Schleswig-Holstein, born on July 9, 1583 but he died shortly before announced marriage on October 28, 1602) and she died unmarried and without issue on May 30, 1622 and was buried at Saint Trinity Monastery. Godunov was the first tsar to import foreign teachers on a great scale, the first to send young Russians abroad to be educated, the first to allow Lutheran churches to be built in Russia. Having won the Russo–Swedish War (1590–1595), he felt the necessity of a Baltic seaboard, and attempted to obtain Livonia by diplomatic means. He cultivated friendly relations with the Scandinavians, in order to intermarry if possible with foreign royal houses, so as to increase the dignity of his own dynasty. Ultimately, however, he was not able to create a new dynasty nor prevent an era of great confusion that would engulf the country until the establishment of a new dynasty. Boris's life was fictionalized by Alexander Pushkin in the famous play inspired by Shakespeare's Macbeth. Written in 1825 and published in 1831, it was not approved for performance by the censor until 1866. The drama consists of 25 scenes and is written predominantly in blank verse. Although revered among scholars, Boris Godunov never received a premiere in its original, uncensored form. Modest Mussorgsky based his famous opera on the drama, and Vsevolod Meyerhold attempted a staging of the play in the 1930s. Meyerhold commissioned Sergei Prokofiev to write incidental music for his production, but when Meyerhold abandoned his production under political pressure, the score was abandoned as well. The world premiere of the uncensored Boris Godunov was given April 12, 2007, at Princeton University in New Jersey, in English translation. The production was based on Meyerhold's design and featured Prokofiev's music, together with supplemental music by Peter Westergaard. Modest Mussorgsky made Boris Godunov the subject of his famous opera. The work was composed between 1868 and 1874 in Saint Petersburg, Russia. It is Mussorgsky's only completed opera and is considered his masterpiece. The libretto was written by the composer based on the drama of the same name by Alexander Pushkin and on Nikolay Karamzin's History of the Russian State. The composer created two distinct versions. The Original Version of 1869 was not approved for production. Mussorgsky completed a Revised Version in 1872, and this version eventually received its first performance in 1874. The music is written in a uniquely Russian style, drawing on his knowledge of Russian folk music and rejecting the influence of German and Italian opera. ↑ John Stevens Cabot Abbott, The Empire of Russia; "The murderers ransacked the palace, penetrating every room, killing every Polish man and treating the Polish ladies with the utmost brutality." Retrieved November 20, 2008. Abbott, John Stevens Cabot. The Empire of Russia: Its rise and present power. (The Monarchies of continental Europe) New York, Dodd, Mead, and Co. (1882) reprint ed. Hard Press, 2006. ISBN 1406914185. Dunning, Chester S. L., Caryl Emerson, Aleksandr Sergeevich Pushkin. The Uncensored Boris Godunov: The Case for Pushkin's Original Comedy, with Annotated Text and Translation. Univ. of Wisconsin Press, 2007. ISBN 0299207641. Troyat, Henri. Ivan le terrible. Flammarion, 1982. (in French) ISBN 2080644734; and in English Translation, (1984) Phoenix Press, 2001. ISBN 1842124196. This page was last modified on 19 December 2016, at 16:34.